We are delighted to announce the first Sake Exchange Tokyo (Party) of 2019. KURAND SET (Sake Exchange Tokyo ) is an international exchange party with sake. The events are aimed at bringing people from all over the world together through this magical artisan beverage. This is another edition of the super popular Tokyo sake exchange party. This month’s event will of course include the usual sake tasting challenge with opportunities to bag a free sake related gift. 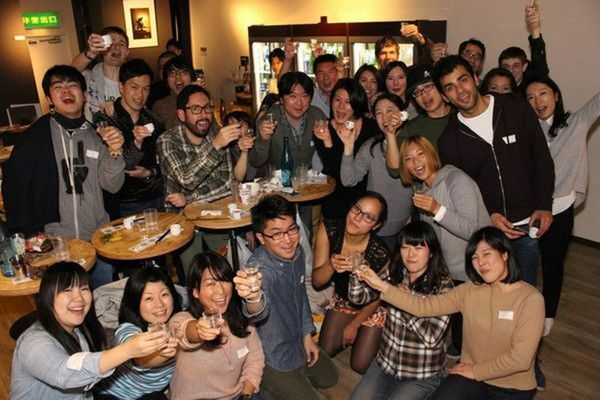 All participants are sure to have a blast with a glass or two of newly brewed sake in hand while making a whole host of new Facebook contacts / friends. All participants must bring at least one item of food to share with other people. This is a condition of participation. ・Meet and make friends with people from other countries and cultures. ・Compare over 100 different types of sake at your leisure. The lineup will include a diverse selection of newly brewed winter sake straight from the brewery. As soon as you have completed this part, you may start enjoying the sake from the fridges ! 17:30: Toast – Kanpai ! Free time starts and last until end of event. During this time as well as tasting over 100 types of sake and fruit liqueurs, beer is also included. You can also have your photo taken wearing traditional sake clothes. The venue must be vacated by 20:30 to allow for the next customers to be seated on time. Food and soft drinks ARE allowed in the venue (no smelly food or food which takes up lots of space). As a condition of entry, each participant is required to bring one dish / item of food to share with everyone. It can be something which you have purchased or something you have made. There is a department store nearby which sells lots of different exciting dishes in its lower floors. Getting blind drunk is not allowed. Anyone who is deemed to be beyond their limits will be ejected and banned from future meetups. Guests are strictly the responsibility of the member who brought them. We take no responsibility for accidents caused by over drinking. If you are coming via the JR lines, follow the signs for the Ginza line underground and then keep following the signs for exit 1. If you are coming via the Ginza line or any other subway line, simply head for exit 1. From exit 1, follow the route shown below. There is a Doutour coffee shop on the opposite side of the road from the venue. It takes about 3-4 mins on foot from the station exit. Head for either exit 1 or 2. On exiting, head up the road and you will find the venue on your left. It takes about 2 mins on foot from the station exit.